This article is part of an educational collaboration with The Jed Foundation (JED). Jan. 25, 2018 -- Teens are more stressed and anxious than in the past, yet their parents will send many off to college with little thought about the mental health issues they might face while there, according to a new WebMD/Medscape survey in collaboration with JED. 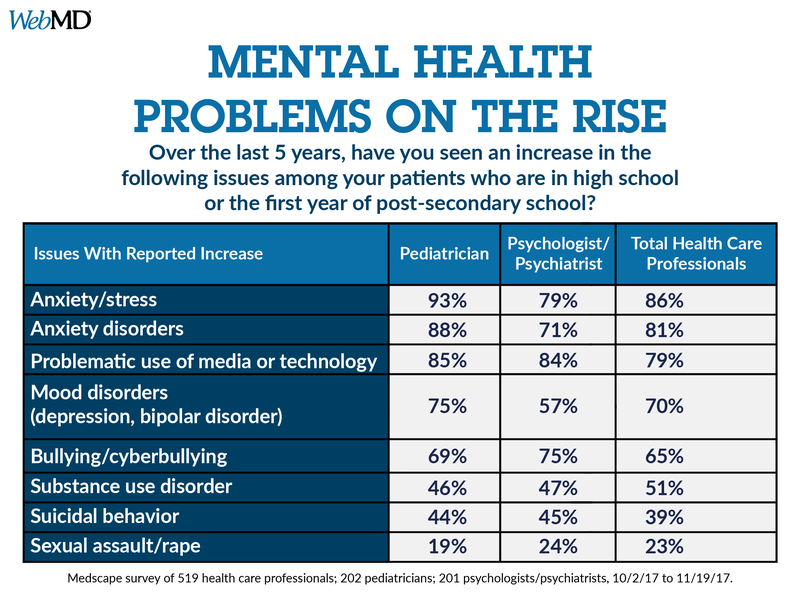 The survey, “Preparing for College: The Mental Health Gap,” includes more than 500 health care professionals, along with 700 parents and guardians of high school students planning to attend college or other post-secondary school, and of students already in their first year. 86% said the teens have had more anxiety and stress. 81% saw more anxiety disorders. 70% reported seeing more mood disorders such as depression and bipolar disorder. Those who answered the survey include 202 pediatricians and 201 psychologists/psychiatrists. Parents who also took the survey confirm their kids are having problems. 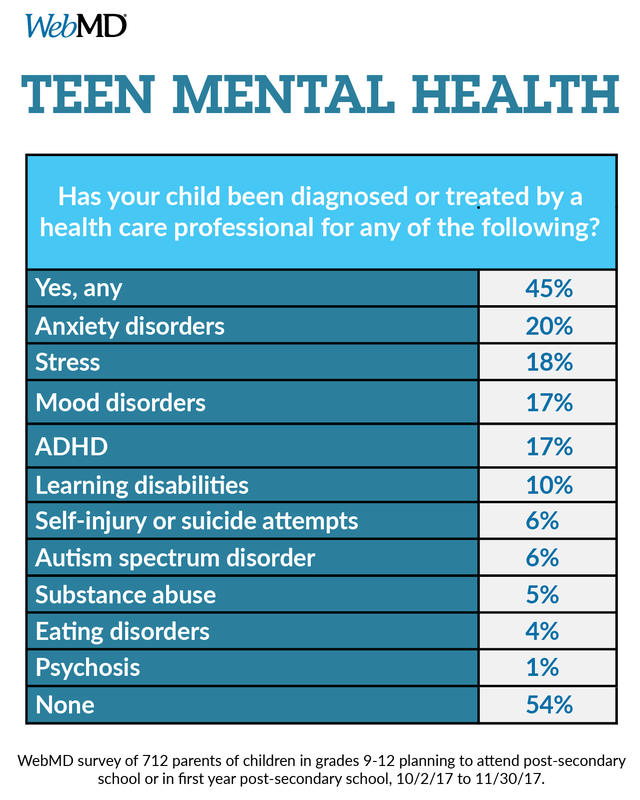 Nearly half (45%) said their child has been diagnosed or treated for a mental health issue, learning disorder, or substance abuse problem. And 51% say their child has seen a therapist. Yet only 17% of parents considered access to on-campus counseling and mental health services when rating schools for their teenager. 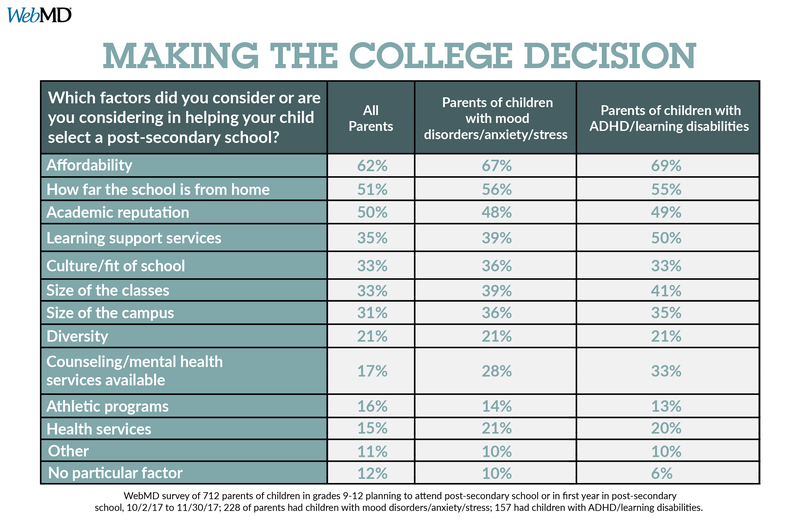 Even among parents of teens with anxiety, stress, or a mood disorder, only 28% said they had considered mental health services while choosing a school. When it comes to talking to their children about mental health issues, about half of parents -- 52% -- mentioned anxiety and 43% discussed depression. The percentage is higher in parents whose teen had been diagnosed with a mental health disorder: 71% of parents discussed possible anxiety, and 64% talked about depression. "If your child is already in therapy, don't assume it's going to go away once they start school. Assume the opposite," says Cora Collette Breuner, MD, a professor of pediatrics and adolescent medicine at Seattle Children's Hospital and the University of Washington. Parents of teens without a diagnosed mental health condition started these discussions at a lower percentage: 31% talked about depression and 42% about anxiety. This survey stresses the need for all parents -- not just those whose kids have problems -- to discuss mental health concerns, experts say. "It's going to touch your family's life, and certainly your child's life in one way or another," says Stephanie Pinder-Amaker, PhD, director of the College Mental Health Program at McLean Hospital. "It does so much to decrease stigma and fear and anxiety just to talk about these issues." Several surveys show there are more mental health problems among teens. Experts interviewed said it isn’t clear whether these numbers reflect a surge in mental health problems or just more openness by young people to talk about them. Whatever the cause, it's critical for parents and doctors to focus on kids' emotional well-being years before college. About 75% of all mental health conditions start by age 24. College falls right in the middle of this vulnerable time. "The college years, developmentally, happen to coincide with the peak period of onset of all psychiatric illnesses. College presents … sort of a perfect storm. You not only have a young person entering the stage where they're most likely to develop a mental health issue, but you also have a significant amount of stress," says Pinder-Amaker, who's also a psychology instructor at Harvard Medical School. She added that there is more of a demand for mental health services on college campuses. A 2017 report by the Center for Collegiate Mental Health found that the demand has risen steadily over the past 7 years. Among students seeking counseling, the most common conditions were anxiety and depression. Access to counseling and mental health services ranked ninth. Jess P. Shatkin, MD, a professor in the departments of child and adolescent psychiatry and pediatrics at NYU Langone Health, said it’s not surprising that mental health services are not high on a parent’s priority list when choosing a college. "I don’t think it’s sensible for the parent of the average kid to say mental health services is a primary issue when looking at a school,” he said. Still, experts say these services need to rank higher on parents' priority list. Breuner says parents usually don't ask her about college mental health services until their child is just about to leave. "I'm always shocked. Why am I hearing this when you're getting ready to put your child on a plane or a bus? Why didn't you do this last year, when you were filling out the application?" she says. Sandy Hutchens said she never considered on-campus services for her daughter, Gracie, who is on medication to treat ADHD. "We were still learning how to deal with and manage it. When it came time for her to apply and figure out where she wanted to go, we just made it about where she wanted to go," she says. Gracie ended up at Utah State University, more than 2,200 miles from their home in Wilmington, NC. On her own, she stopped taking her medication, and her grades fell. Hutchens says she won't make the same mistakes when her younger daughter, Maggie -- who has anxiety -- joins her sister at Utah State next year. "I will go to the health center. I will meet face-to-face with the doctors there. I will do better than I did with Gracie." While parents focus on academics, untreated depression and other mental health issues can take a toll on kids' college performance, leading to a lower GPA and a higher chance of dropping out, research finds. Such problems can also raise the chance of dangerous behaviors like drug and alcohol use and suicide, which is one of the leading causes of death in this age group. An estimated 1 in 5 teens are living with a mental health condition. Yet because teens often bottle up their feelings, parents may have no idea what emotions are simmering under the surface unless they bring up the issue. "If you don't ask, you don't find out," says David Hill, MD, a pediatrician at KidzCare Pediatrics in Wilmington, NC. 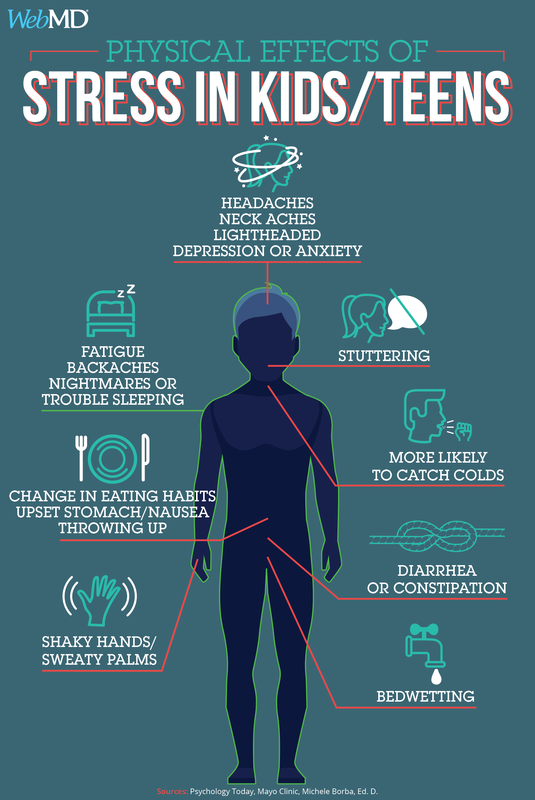 "Sometimes you have signs and symptoms, but those can look a lot like being a normal teenager." How do you ask teens about their mental state? Hill says the conversation is difficult to start. He suggests that you offer a "no freak-out promise." "Whatever you tell me, I promise not to freak out. I may not be happy about it, but I'm not going to lose it," he says. "One of the reasons kids clam up is because they're afraid we're going to freak out." Use open-ended questions so your child has to respond with more than one-word answers. "What's the best thing that happened to you today? What's the worst thing that happened to you today? What are you looking forward to? I think that's a big red flag, when a child can't tell you one thing they're looking forward to," he says. Pediatricians and family doctors should also ask the right questions. "Assessing mental health is critical to any teen wellness exam," says Hill, who's also chairman of the AAP Council on Communications and Media, which studies the effects the media have on children and adolescents. The survey found that while 89% of psychologists and psychiatrists felt very prepared to screen their patients for mental health conditions and emotional issues, only one-third of pediatricians felt the same way. Doctors should also help get teens emotionally ready for college, but that doesn't always happen. Less than half of parents (47%) said their doctor helped prepare their child for the transition. Just as a college's academic quality can run the gamut from top-notch to subpar, the quality of its mental health care services can fall within a wide range. And you won't know whether the schools your child is applying to can meet their emotional needs until you see what they offer. "I think it's a good idea for all parents and students to consider counseling and mental health resources in the pre-application process," Pinder-Amaker says. To learn what they offer, she suggests you visit the school's website with your child. Search for a few keywords -- like "depression," "substance abuse," and "anxiety" -- and see what you find. If the college's counseling center and other resources immediately pop up, "that's an indication the school is aware of those issues and they're taking a multi-pronged approach to anticipating the needs of their students," she says. Are counseling services free? If not, how much do they cost? How do students set up appointments? How long do they usually have to wait for an appointment? Are there limits on the number of counseling sessions a student can have? Also ask about on-campus mental health-related, student-led groups that can offer information and support, such as Active Minds or Students for Recovery, Acosta Price says. And find out whether the school has substance use, suicide, and sexual assault prevention programs in place. Pinder-Amaker suggests that you also register your child with the college's disability office, which isn't just for students with physical or learning disabilities. "Psychiatric illnesses also entitle a student to access the disability office and a whole range of resources," she says. Those resources include special accommodations like priority housing or a flexible schedule. As soon as your child has chosen a school and been accepted, set up a smooth transition of care from your child's doctor at home to the provider on campus. "If a student waits until they get to school, there are too many demands in making the adjustment to campus life," Pinder-Amaker says. Students who defer setting up their first appointment until they get to school could wind up at the end of a long waiting list. Your child's pediatrician, psychologist, or psychiatrist can help identify local mental health providers and transfer your child's care to them -- what doctors call the "warm handoff." Ideally, they should continue to coordinate care with the campus doctor after school starts. Yet that doesn't always happen, the survey showed. Less than half (46%) of psychologists and psychiatrists said they regularly keep up with care coordination once college is in session. It's hard for parents to ensure their kids are mentally healthy when they're hundreds or thousands of miles away. Apps like Skype and FaceTime can bridge the distance between home and school, and help you keep tabs on your child while they're away. "Set up a time to talk to your kids and have a real conversation. You might say, 'Every Sunday at 11 we're going to talk for 20 minutes,' " says Shatkin, who's also author of Born to Be Wild: Why Teens Take Risks, and How We Can Keep Them Safe. Don't hover too much, though. Independence is a skill that teens need to learn long before college. Start to lay the groundwork a year or two before high school graduation. "Teach them how to do their own laundry. Teach them how to make their own meals. Teach them to exercise and get on a positive sleep schedule. All of those resilience factors come out in a big way once you start college," Shatkin says. Also let your child be more responsible for their health. Have them manage their medication, including prescription renewal. Teach them how to set up doctor appointments and bring up mental health issues with their providers. Remember that once your child turns 18, they'll be in charge of their own medical care and you'll be legally cut off from accessing their medical records. If you want to stay involved, you'll need them to sign a document giving you access to their medical information. Just 25% of the surveyed parents said they had talked about this document with their child. Even the highest-quality college mental health care program can't guarantee your child will succeed in school. And considering that the average private college tuition is $47,000 per year, Pinder-Amaker recommends investing in tuition insurance. Many policies will cover the costs if your child has to withdraw early, but check to make sure mental health issues are included. "It's a nice safeguard. It can do a lot to allay the anxiety of the student who feels an additional financial concern," she says. WebMD survey of 712 U.S. resident, self-reported parents or guardians of children in grades 9-12 (or equivalent) who plan to attend post-secondary school, and parents or guardians of children already in their first year of post-secondary school, Oct. 2 to Nov. 30, 2017. Medscape survey of a random sample of 620 U.S. Medscape members, including 519 physicians practicing in pediatrics, adolescent medicine, family medicine, gynecology/women’s health or psychiatry, and 101 psychologists, from Oct. 2 to Nov. 19, 2017. See full methodology for both surveys here. Academic Psychiatry: "College Students: Mental Health Problems and Treatment." Olga Acosta Price, PhD, associate professor, department of prevention and community health, The George Washington University. College Board: "Trends in Higher Education." Cora Collette Breuner, MD, professor, pediatrics and adolescent medicine, Seattle Children's Hospital and the University of Washington; chairwoman, AAP Committee on Adolescence. Consumer Reports: "Should You Buy College Tuition Insurance?" David Hill, MD, chairman, AAP Council on Communications and Media; pediatrician, KidzCare Pediatrics, Wilmington, NC. National Alliance on Mental Illness: "Mental Health By the Numbers," "Mental Health Conditions." Jess P. Shatkin, MD, professor, departments of child and adolescent psychiatry and pediatrics, NYU Langone Health; author, Born to Be Wild: Why Teens Take Risks and How We Can Keep Them Safe. Suicide Prevention Resource Center: "Suicide by Age." The B.E. Journal of Economic Analysis & Policy: "Mental Health and Academic Success in College."